Hungary's parliament approved a law that targeted foreign-funded NGOs last year saying that they could "threaten the country's political and economic interests and interfere with the functioning of its institutions." While the bill did not mention Soros directly by name, many Hungarian politicians have said they wanted to sweep Soros-tied organizations from the country. Following the stepped up pressure, Soros's organizations said in May that it had become impossible for the Open Society Foundations to operate in Hungary and announced that they would be leaving. The group said that their operations would be moved to Berlin. The $10.37 million Soros's Open Society Policy Center put towards lobbying during the second quarter of this year is slightly more than its previous high of $10.3 million from the fourth quarter of last year, which runs from Oct. 1 to Dec. 31. Soros's lobbying arm spent more ($16.2 million) during Trump's first year in office than it had any previous year. "We make different grants each year depending on what is happening in Congress and there was a lot going in 2017: Protecting immigrants and refugees, preserving fairness in the tax code, advocating for criminal justice reform, pressing for disaster relief for Puerto Rico, and promoting a progressive U.S. foreign policy," Jonathan Kaplan, a spokesman for the Open Society Policy Center, previously told the Washington Free Beacon. Between 2002 and 2012, the policy center reported spending $19,120,000 total on lobbying expenses, which averages to $1.9 million per year. 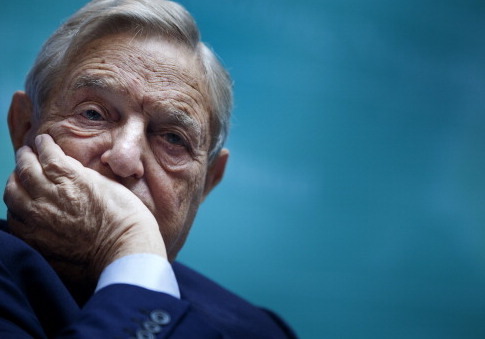 Soros's lobbying budget shot up to $11 million in 2013. The most Soros had spent prior to last was $12.4 million in 2014. Soros has spent $12.89 million during the first half of 2018, which could ultimately end up as another record year for the financier's lobbying activities. The Open Society Policy Center did not return a request for comment by press time. This entry was posted in Politics and tagged 2018 Election, George Soros, Lobbyists. Bookmark the permalink.